I had intended to applaud the present state of London’s bus services and support this highly subjective view with a mass of statistical data showing just how superb things now are. Unfortunately, when I searched for the evidence, I not only found it very inconvenient to tease out, but what I teased didn’t support what I had intended to say! I am not giving up on the project and getting trustworthy data is now a priority, to be followed by a rather different set of conclusions to those I was expecting. All this will be the subject of a later blog. For now may I just leave it that whilst, on pretty much any measure, London’s bus services are far better than anything being offered in the mid-1980s, if one goes further back I am not so confident that things will be so clear cut. Whilst the number of buses may be comparable with (say) the 1950s, nearly all the efficiency measures do not seem so good, even allowing for London’s growth and that of its population. This seems counter-intuitive, so, more anon. Notwithstanding the statistical conundrum I do think London’s bus services are quite good these days. I say this from the point of view of someone who is a frequent user, and has had cause to be using them in lots of unfamiliar parts of the capital. However, there are some features that in part puzzle me, and in part really annoy. After initially just observing them and regarding them as a London eccentricity, I started to think that the only reason an organization like TfL tolerates them is because they (at least officially) do not know they are happening. It is perfectly possible to see things without actually ‘observing’ anything, even quite innocently! This is a pity, because (to me) they take the edge away from what is actually rather a good service and don’t seem to me all that difficult to fix. They are mere annoyances, but annoy they do and on occasions they have cost me and other passengers time and frustration. I list them below. I use buses quite a bit, and over the last few years have found myself using them all over London and in areas I do not know at all. For this I have found the bus map invaluable. Whilst a fan of new technology, such technology (at the moment) works best where both start and end points are known. This is hopeless for my particular purpose where I am having to make rapid decisions on the fly and do not necessarily know where I need to get off, or I want to ‘take a view’ about changing buses or travelling further and walking. The bus map is perfect for my needs, I always carry one and would be inconvenienced without it. The splitting of the maps into four zones is understandable and only a mild irritation given the generous overlap between the four quarters. For example the overlap between north-east and north-west quarters is 8½ inches, or a little under 6½ miles at the drawn scale. Where it becomes a nightmare is at the interface with the central area. Because of the eccentric way the overlap is managed it is hard to give an accurate extent to this region, but it is not only not very much but it is achieved in a quite different way to the overlap of the quarters. I don’t think you could regard the overlap, to the extent it exists at all, as much more than half an inch (less than a 5-minute walk). If we take, as an example, the north-west London bus map and look at the western boundary with the central area, it runs in a straight line from Harrow Road to Lillie Road. This precisely matches the western extremity of the central area map, where the world simply stops at its edge with little indication what happens farther west. Thus, to the extent the concept of overlap exists at all, it only exists on the relevant quarter-London map and within the yellow boxed area marked ‘see overleaf’ (in itself an inconvenience I will return to). Along this boundary, eight roads pass into the central area. In several areas it is quite possible to work out which buses, along which roads, pass from one map to the other, but in some cases it is far from obvious what happens and a degree of persistence is needed. Do look at the Shepherds Bush area where I am not sure it is possible to know with certainty how what is shown on one map translates across the boundary to the other. Please consider, also, that these maps are on different sides of the same sheet of paper, and not side by side, as I have put them below. But wait a minute. Tracking a route from one map to another is all very interesting but it isn’t what the maps are for. What I can do pretty much anywhere else on the bus map is have some conception of where I am, and of where I want to go, and identify a suitable bus route that will take me between the two and, if there be a choice, to offer me a delightful selection of alternatives from which to choose. This is simply impossible where your origin is on one map and your destination on the other side and the maps are to a different scale, there is virtually no overlap and they don’t marry up very well. Examples of the difficulty are pitifully easy to find. If one wanted to travel between (say) the Chalk Farm area to Shepherds Bush the obvious route darts in and out of the central area and the north-west London side of the map several times and with virtually no overlap one really struggles to work out what is happening. I think it is impossible to work out, between these two maps, what happens to the 187 at the northern end of its journey until you work out that the top left area of the yellow shading does not mean ‘central area’, but might mean it is only shown in full in one of the small Local Area Maps, but there are few clues how to identify the correct one. And so on. Some of the rest of the cartography isn’t very good; either it’s tired or careless, or just doesn’t take what passengers can see into account. What, exactly uses the one-way road just beneath Abbey Wood station, for example? Where, exactly, do the buses go in the area between Westcombe Park station and the adjacent roundabout next to Westcombe Hill. I was recently on a bus here and was a bit disconcerted when the bus appeared to be going the wrong way. In short, the map design is now very old and needs revisiting. I don’t think the quartering needs changing, but the interface with central London is dreadful and needs rethinking as it just isn’t fit for purpose. Surely it cannot have been ‘designed’ by anyone who actually uses buses? Managers, with the encyclopaedic knowledge we know some of them have, probably never need to use a bus map and just cannot see this serious and unnecessary fault. Another handy thing to add would be the hail-and-ride areas. I recently needed to go somewhere in the middle of one of these (on the B11) but had no idea there was a hail and ride section, which isn’t referred to on the map at all. I eventually worked out what was happening and induced the driver to stop in the middle of a section of road with no houses or footpath. When I needed to get another bus to start the next leg of my trip I had no idea where the hail and ride section started or stopped and ended up walking a long way to a fixed stop to be certain of catching a bus. What’s the point of a bus map not showing a feature like this – surely the only way of making it clear precisely where a hail and ride zone is located? I have no idea where hail and ride areas are, or how I am supposed to know about them. These bus maps are very useful but the cartographic quality has failed to keep up to expectations and the workarounds (like the large number of local map insets) are far too numerous and very irksome to keep switching to. The lack of overlap between central and outer maps is much too small given the bus density in this area. Also the paper on which printed, though no doubt cheap, is too cheap and even a fresh map quickly splits along the folded creases, so I have to change maps more frequently than I otherwise need to. I’m sure slightly fewer need be printed if the quality were better. I do realize that with modern technology maps may not be as useful as they were, but they do fulfill a role the technology is not (by some way) yet capable of and deserve a bit more attention to detail. (By the way I co-authored an article for Information Design Journal on this map’s appalling predecessor some years ago so do think some of these points are valid – this map is a delight compared with what went before). Any Underground user will be all too aware of the constant barrage of information that is being hurled at passengers. I say information, for some of it is borders on mere propaganda. Nevertheless , one occasionally feels that there is some kind of imperative to ‘give information’ even if what is given has yet to reach that plateau of consistency and usefulness that real passengers would wish for. Sometimes, of course, it is very useful and has an immediate impact on what passengers do next. Not so, on the buses. In fact it is hard to believe we are dealing with the same organization. I do understand how much more difficult a challenge it is to give up-to-date information on a bus service, for all kinds of reasons, but there doesn’t seem to be any will. For example, within the last few months I have been turfed off several buses which have turned short of the destination advertised when I got on (I thought this kind of thing had stopped years ago, but evidently not). On each occasion, the only advice was from the electronic announcement made when a driver alters the destination blind setting. On no occasion was any human announcement made offering, for example, an apology, an explanation, or any advice about what to do, or the prognosis for another useful bus arriving. In this day and age, I do feel we can do better than this. There have also been several occasions recently when I have been on buses that have been very badly affected by severe traffic congestion. It is perfectly obvious that bus staff were aware of it because I made a point of overhearing the radio chatter. I can’t begin to describe how helpful it would have been if this information had been shared with passengers in the same way that a prognosis of a slow journey on the Underground would have been made by a train operator. People would have got off and walked in some cases, or found another route, or not got on the bus at all. The bus live departures displays (of which I am a huge fan) cannot either now or in the future offer any advice about onward journey time or other useful information such as diversions. Whether the driver says anything useful when one gets on is at best rather unusual (and in any case only applies on buses where one passes the driver). On-board PA, it seems, is very rarely used. The passengers are just left to get on with it. This ought to be fixable. This is really an extension of my previous point. The gripe is that diversions are only rarely spontaneous and therefore it should be possible to get better information out. I have been the victim of a number of buses running off route in the last few weeks and I’ve been fascinated to observe what happens. Except for long-planned diversions, what happens is that passengers don’t get much, if any, forewarning. On all of the ones I have experienced there is an automated announcement saying the bus is about to embark on a diversion but no clue is given about how long the diversion is or where the bus goes back onto its route. This is hopeless, for if one is near the desired destination one doesn’t know whether to stay on the bus or not. Off the bus goes, on some mystery tour, and the ‘next stop’ indicator goes dark as it cannot cope with going off-route. And there we all sit. In several instances people (including me) have wanted to get off along the diverted portion, either through panic or because they recognize somewhere as being near where they want. But what is the protocol? Is the driver going to stop anywhere? We don’t know. Is the driver allowed to stop? We don’t know. Myself, if I want to get off, I shuffle up to the driver and ask if he’s going to stop anywhere soon and usually we contrive to pull up at some random nearby bus stop and those who want to escape get out. But what we supposed to do? Guidance would be helpful but proper announcements would be more helpful. 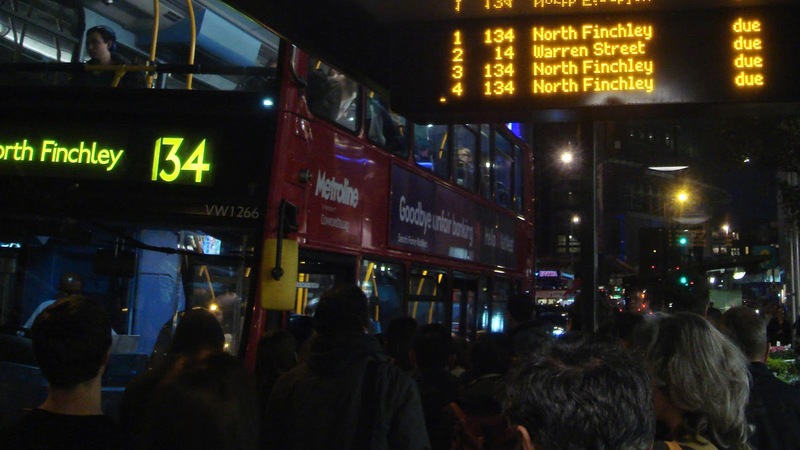 It isn’t as though TfL has only just discovered buses have to divert – the fact it happens occasionally is entirely predictable and can be planned for. I am aware that sometimes diversions make it onto the TfL twitter feed. Sorry. Not good enough (nor is the quality of what is put, often so vague a generalization as to be useless for any practical purpose beyond satisfying the corporate conscience that ‘we did warn you…’). What is the public address system for if it is not used in circumstances like this? This is a problem resulting in part from the lack of information issues already highlighted and it occurs when there are substantial and unexpected delays (ie unexpected by passengers) on buses where one becomes desperate to get off but ‘for our own good’ we are not allowed to. Now, as a transport professional I do understand why there is this rule, but read on. I was recently attempting to get from Wembley Park to Wembley Central and as I passed the bus stop an 83 bus happened along and I got on it, a decision I soon regretted. It was full-ish and I was standing, but I had expected the journey to take no more than about five minutes. Within a few seconds of leaving the next stop (ie about a minute into the journey) we found the end of a line of traffic pretty much stationary (but not visible from where I’d boarded). After about ten minutes, during which time the bus had moved perhaps 50 yards, the passengers were getting very restless, to say the least. The bell was being rung continuously and shouts were made to open the doors, to no avail. The driver was clearly determined to obey orders. Now, fair enough, one might think, even though the bus was next to the kerb and nobody getting off was likely to have had any problem. However, the bus behind, a 182, was another Metroline vehicle and I was able to see from where I was standing that its driver had opened the doors between stops and virtually everyone on it had got off and was now walking past us. Others could see this too and this gave rise to more frantic bell ringing. We then crept forward into an area of road junction where it was clearly unwise to open doors and it was another five minutes before we got to the other side. We had still not reached the next bus stop when, unexpectedly, the driver now did open the doors and the bus virtually emptied and a lot of hot and bad tempered people got off and stomped up the Hill. Now if a rule is a rule and he broke it now, we were all wondering why he couldn’t have broken it ten minutes earlier… Again, there were no announcements, no apologies, just a complete lack of engagement with the passengers on board. Lest anyone thinks what I am describing is unusual, it is not: I see this kind of thing all too frequently. The aggravating thing is not knowing about the delay ahead, and not knowing whether the driver will or will not open doors intermediately. So, what are the rules about opening doors under circumstances like this? Someone will surely say they would hope drivers apply common sense. Oh dear – I would like to see that in a contractual bus operator’s agreement. (If anyone’s interested, this misfortune was on 6 November involving vehicles VW1760 on 83 and VP622 on the 182 at about 15:25 near Wembley Hill). After release from our confinement I walked up the hill, passing all the stationary buses in this photo. By the way, when I got to the road junction with the High Road, at the head of this lot, what did I find? Nothing. No road works, accidents or the like. Not even a badly parked car. Extraordinary. When is a bus at a bus stop? Usually a bus will stop somewhere near the bus stop post and we all know it has arrived. However, if there is already a bus at the stop, then the next one will pull up right behind. Its doors will open, but passengers wanting that particular bus will already have begun moving towards it and by some unsaid means we all know that it, too, has arrived. After loading it will simply carry on along its merry way. We can probably extend this phenomenon to a three-bus situation, but, after that, things begin to get a bit less certain and there must be a break point where, as we further increment the number of arriving buses to implausible proportions, we can say a bus has not actually arrived at the stop. I was a bit surprised to find myself in Bishopsgate recently, attempting to head north, when great swathes of buses turned up. This is a hideous stop serving (so it seemed to me) at least ten routes and located awkwardly amongst very busy road crossings. At one point there were six buses one behind the other (the first definitely at the stop and the others with diminishing certainty). One problem was that with the buses arriving in this way we actually had no idea what routes were being served by the buses at the rear as their fronts could not be seen. One or two people panicked and set off to find out, and I noticed that they were let on. I took the view that the two or three buses at the rear were not at the stop and would pull forward when the buses in front had gone away, and in fact that is exactly what buses five and six did (I actually found bus six was the one I wanted, a 48). Once more I speculated about what the rules for this were, and how unfamiliar passengers were supposed to know. I have certainly been on buses that have had to stop well back from a stop and having performed peremptory stop duties just set off, not actually calling at the stop itself and clearly (judging by the arm waving) leaving people behind. What were they supposed to do? What are the rules? Is the bus going to stop at all? That brings me to the subject of bus stops. It seems to me that somehow something once so straightforward has got into a bit of a mess. In two-person days the system of compulsory and request stops always appeared to me to work reasonably well. The instructions were clearly printed on London Transport publicity (and I think occasionally at stops). Basically a bus would always call at a compulsory stop but at a request stop a waiting passenger had to make a hand signal whilst someone on a bus had to ring the bell once. Conductors used to help out (no doubt irregularly). Usually on late-running buses a conductor would see that no-one wanted to get off, and perhaps look out and observe no-one was waiting to get on, and give a double ring of the bell which told the driver he needn’t bother to stop. The practice was particularly noticeable on garage journeys, for reasons that might be fairly obvious (I have lived near several garages and had some of the fastest bus journeys ever on late night garage journeys). An example of the bus stop flag instructions from the days when crew-operated buses predominated. I will forebear from commenting just now about the death of queuing. Basically this well-honed custom and practice began its long and tedious collapse when one-person operation became the norm. With no conductor, drivers took it upon themselves to decide when to stop, or not, irrespective of flag type. Today, it seems to me, it is an utter free for all. There are no instructions or explanations for passengers that relate to the two stop types – each pedantically identified by its flag according to some formula, no doubt. We do not know what drivers are instructed to do either. As a result there is almost always someone in a crowd at a compulsory bus stop who wants to wave a paw about, even though it is not necessary. Whether they know the difference between stop types I could not say, but why would they know? In any case they probably just don’t trust drivers to stop, even where several people are waiting and there is only one route. On board, of course, there is a cacophony of bell-ringing pretty much at every stop, whether compulsory or request (and how is a passenger supposed to know what kind of stop is approaching anyway?). I think the maximum number of ‘non-deliberate’ rings I’ve heard is 12. Whether everyone is deaf and also doesn’t understand the purpose of the on-board ‘bus stopping’ sign we will never know. The point is that if this system worked properly, then at most bus stops in London it ought not to be necessary to operate the bell at all: the bus should stop. I recently came a cropper on an H10 when I wanted to get off at North Harrow station and the bus just sailed by. I had not rung the bell knowing the stop to be compulsory and it served a station where usually one can rely on someone getting on or off. It is true I hadn’t got up from my seat, but that is because it was next to the door. I was over-carried. Now, this was a driver making that decision but it is surely not reasonable to say ‘I won’t stop if nobody has got up and walked to the door’ because old people would be daft to stand up too soon and risk falling over as the bus decelerated. This lack of discipline or control cannot fail to confuse, mislead and sometimes inconvenience passengers and seems such an obvious shortcoming I am curious it is tolerated. I am not myself sure there is the slightest point in maintaining two different types of bus stop in this day and age and at a time where it seems impossible to manage crew behaviour or passenger expectations and knowledge alike. That battle, I fear, has well and truly been lost. Better to have one system, educate the passengers (so far as one can) and enforce whatever the rules are upon staff. It seems to me that pretty much every stop in London is now de facto a request stop and if TfL harbours any ideas to the contrary then it will have to show a great deal more energy and enthusiasm in explaining what the policy actually is and then enforcing it. I cannot see this happening. I notice the present bus maps have only a picture of a ‘compulsory’ flag, but the instructions for getting on or off buses are for ‘request’ stops. How, then, are request stops intended to differ? I have recently noticed some new request stops in surprising places, like outside Dalston Kingsland station, not exactly a quiet, secluded spot with only the occasional passenger. This is chaotic. What lessons can we learn from foreign cities, I wonder? Another source of mystery and puzzlement is the closed bus stop. This is usually because of road or pavement works. In the days gone by when a bus stop had to be closed London Transport went to great lengths to offer some kind of nearby alternative, often marked with a temporary stop (they were nicknamed dolly stops). For a number of reasons this does not happen anything like to the same extent as previously, and stops are simply closed. The first people on the bus know about this is when an automated announcement simply says ‘next stop is closed’. There is never a human voice or an apology, or advice about what to do, and as the notice given is rather short I’m not sure passengers have enough time to consider their options properly. Last year, two consecutive stops on the H10 were closed for a couple of days with no alternative offered; imagine how hilarious some of the older passengers found this. Sometimes I am baffled by the decisions made. Recently a bit of road surface was disturbed at The Cricketers on Wimbledon Common, so the adjacent stop was simply closed, even though there was an adjacent bus yard (still in use), the location is a minor interchange and it was some distance to walk from stops either side. It was a wide road where a temporary stop appeared to be possible if, for some reason, it was not possible to stop in the bus yard. I had planned on getting on a bus here and it was far from clear from the inadequate notices where I was supposed to go. Not a twenty-first century experience, I thought. I understand that local councils are difficult to communicate with about coordinating bus stopping needs with road or utility works. I also appreciate that with so many front gardens now converted into car parks it is hard to identify suitable alternative stopping points. Even so, I can see only a school-master’s 7/10 mark for ‘effort’ for handling temporary stop closures when it should be 8/10! Some people depend really heavily on buses stopping where expected and it is a huge problem for them if it doesn’t and if there is no prior information. I had thought that with modern technology the sin of dawdling had long been consigned to history. Dawdling used to be a sin committed by early-running drivers who, having had no regard for timekeeping along most of the route, would proceed ever more slowly as they approached timing points. I’m sure you know the kind of thing: driving slowly; stopping at every stop whether there’s anyone there or not; timing one’s departure from a stop to catch the traffic lights changing to red; slowing down at lights whilst praying for them to change to red, sometimes doing an emergency stop on a late yellow. And so on. My father (a policemen in the 1950s) told me the police forbade dawdling because in central London such buses became an obstruction. Dawdlers had to be reported. Anyway, it still happens – though perhaps not very frequently. Whether drivers know how irritating this is for on-board passengers to endure is a matter for speculation, but irritating it is for people who have paid money and invested time in their journey to find themselves sitting on a bus obviously dawdling along an empty road. I cannot believe today’s tech-savvy managers don’t know it’s happening now (as they always knew it happened, but providing drivers didn’t get caught they preferred not to see it). I do not doubt it is hard to deal with, but to admit that it happens would seem to be a necessary first step. That buses bunch at all is rarely the fault of drivers unless they are particularly reckless timekeepers. Bus schedules are inherently unstable because any delay to a bus means it carries a heavier load than expected and is therefore liable to lose further time. Naturally this allows the bus behind to start catching up, and since this means the bus in rear carrying fewer passengers than expected it is liable to catch up the delayed bus in front quite quickly, condemning them to run forward as a pair. Then the next bus catches up, and so on. If this isn’t attended to, the service is liable to fall apart quickly with enormous gaps appearing and very long waiting times. Since bus operation is a dynamic activity, the management attention needed is constant. In later LT days it was, to say the least, at best indifferently managed and often it was appalling. There was no technology in those days and the passing of buses was noted by road inspectors who had few remedies available, mainly confined to turning buses already in a bunch short to try and fill an expected gap the other way (whether such gap actually appeared or not). There is no excuse today, where pretty much anyone can find out where any or all of the buses are at any moment, thanks to new technology. If I can do it from my mobile phone, I have no doubt a specialist control room ought to be able to do it better. But bunching we still get. And where you have a bunch, someone somewhere else is getting a corresponding gap. Unfortunately, in the passengers’ mind, a bunch of buses only counts as a single vehicle since he or she can only take advantage of one of them. A gap, however, becomes very noticeable, and because more and more people arrive during gaps everyone gets to see it. This has a disproportionate impact on waiting times because the longer a gap is the more people are exposed to it. If one wants to reduce waiting times, then for a given number of buses you must run them regularly. There was quite a crowd waiting patiently for this bunch. Thinking I wouldn’t get on the first, I boarded the second. This was turned short en route, with nothing more than a recorded announcement and the internal lights being flashed on and off at Archway by an irritated driver. Several disgruntled passengers. I don’t propose to say what can be done beyond all the new technology we have installed already that should be regulating buses in real time, but having done a lot of riding around it seems to me that London traffic is a lot more unpredictable than I recall, and that cannot help. Why it should be I don’t know, but with all the data that is available to us these days I think we ought to know and it ought to be making bus services more regular than they appear to be. 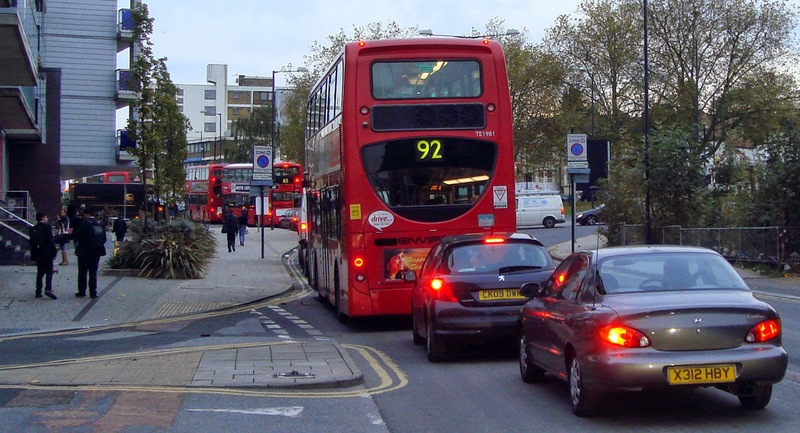 With TfL responsible for many of the bus roads, dealing with bus-impacting traffic congestion should surely be easier? If it isn’t, then perhaps the Greater London mayoral social experiment needs another look. So there we have it. I do think London’s buses are quite good, and it is noteworthy they carry half of the entire country’s bus users. The points I have made (some, I admit, with an element of exasperation) are because I think the services could be even better, because I care and because I do wonder if managers are conscious of them (and if so what is being done about them). I may of course be entirely on my own in finding fault, but, all the things I have referred to I have seen myself and have overheard uncomplimentary remarks made by other frustrated passengers, so I don’t think so! I’ll now get back to my bus statistics. This entry was posted in Road Transport and tagged Operational. Bookmark the permalink. 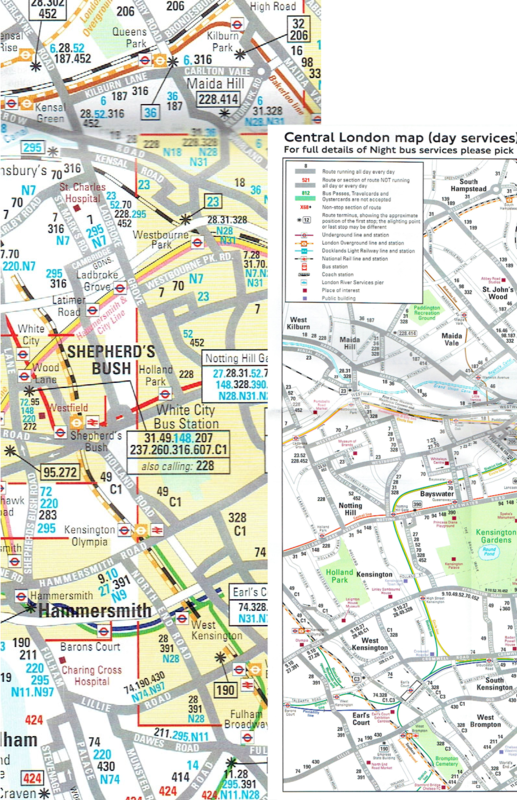 2 Responses to London Bus Services – A Route to Perfection? Re paper maps: is there not one of the central area? I'm sure I got one a year or two ago (at Hackney Central – they were very helpful, gave me a full set). Yes – but unless one wants to fight two maps (rather than one sheet with a map each side), it doesn't really help much with journeys that dart along the border as the boundaries are the same. There are many very simple solutions to this, any of which would increase the margin of overlap between central and outer maps, I suggest.